The Eagles are undoubtably at a crossroads in the backfield. Yet given the huge change at quarterback, if anything the turnover at running back has been overlooked. Two years ago Brian Westbrook was one of the best halfbacks in the NFL and received a raise from the Eagles for the vital role he played on the team. Eight years, 107 regular season games, some of the most spectacular performances we have ever seen. Now he’s gone. 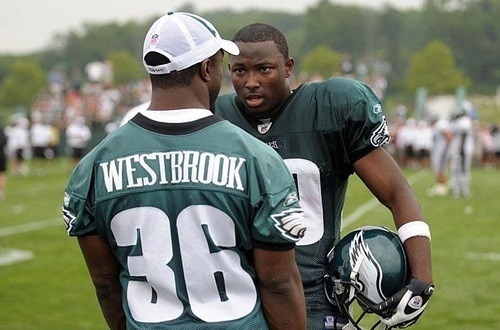 There’s plenty to discuss about the future, and I’m working on a companion post about LeSean McCoy, but for now, let’s just look at the past — gaining some insight into Westbrook’s career and Eagles running backs in general. For the first chart, I went through the seasons of data and attempted to isolated 1st & 10 rushes. The problem with taking all of the rushes as one big group is that you pull a lot of short yardage, goal line, and passing downs into the equation. This does decrease the sample size, but you take what you can get in order to make the data more usable. 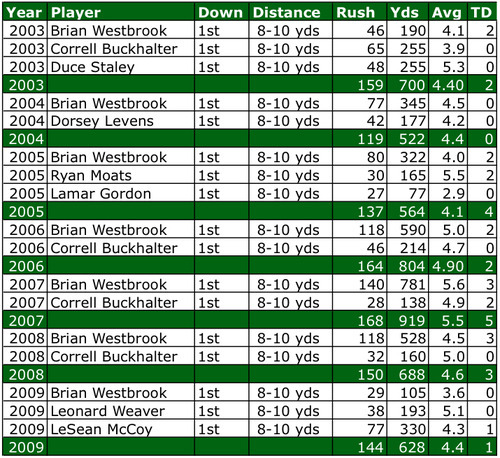 Correll Buckhalter was really good as Westbrook’s back-up from 06-08. Then Leonard Weaver stepped in last year and provided basically the same numbers. It’s interesting that the Eagles felt they needed to bring in Mike Bell when Weaver proved so effective as a change of pace back. Perhaps they just want him blocking more. As a running team, the Eagles reached peak effectiveness in 2007. Not coincidentally, that was the year the Eagles most tried to ride the Westbrook express — to the tune of 368 touches from scrimmage. This is unnecessary, but damn Lamar Gordon was bad. 2009 wasn’t the Eagles’ most effective rushing year, but despite having most of the carries taken by two new additions, it wasn’t that much worse than 2008, or the Super Bowl year of 2004. In other words, good enough. Speaking of 2009, McCoy may have trailed Westbrook overall in yards per carry, but when you standardize the carries, LeSean was much better than his hobbled mentor. 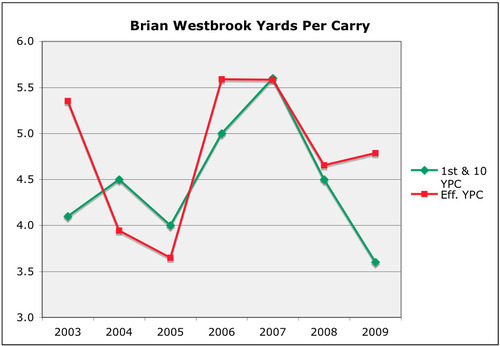 The thing that jumped out to me first was how similar Westbrook’s career looks to Donovan McNabb’s, when I made his graph a few months back. McNabb’s career peak came later in his career (makes sense for a QB), and Westbrook was reaching the top of his game just as McNabb was just starting to decline (an interesting topic for later dicussion). Yet the career shapes are very similar: a few years of middling potential, followed by a peak of 2-3 years, and finally a drop. As with all stats, DVOA sees something slightly different than my selection of first down runs (especially last season, when Westbrook was really bad on 1st & 10). But overall, they all likely reflect this same, impressive career arc. Too bad that career won’t end where it began. Tagged with Philadelphia Eagles, Running Backs, Brian Westbrook, LeSean McCoy, Correll Buckhalter, Leonard Weaver, 1st Down, Career, Average, Statistics, Yards Per Carry, Football Outsiders, Donovan McNabb, Mike Bell, DVOA, Decline, Peak. June 28, 2010 by Brian Solomon.